Mom, the Intern: Hey, honey. Last week, the weather was celestially perfect (no, I mean it). Never mind the fact that it turned to hell yesterday when it rained and hailed pretty much constantly and the temperature dropped 30 degrees. Thankfully, it was gorgeous over Spring Break, so I thought we'd take advantage and take the family to the Superstition Farm's Super Farm Market. Cows, cows and more cute cows. 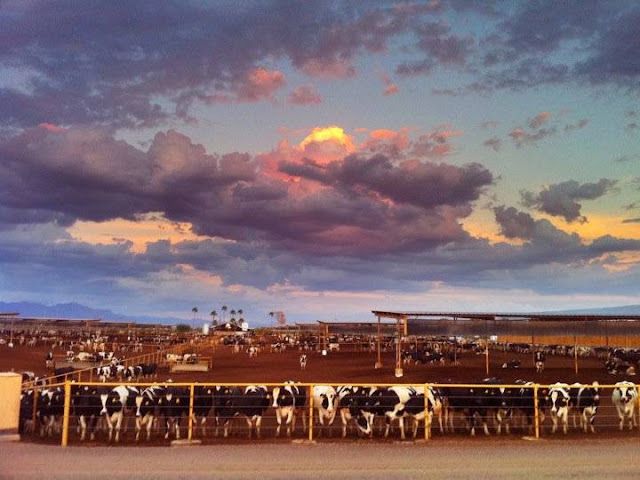 Basically, it's a huge dairy farm off of Hawes and Elliot in Gilbert. It's the one that always stinks as you're driving on the 202 (apparently some people like this smell?). But it's SO fun to take your kids there or, heck, to go there by yourself! In addition to a bajillion darling milk cows, they offer hayride tours, a rescued animal petting farm, a jumping pit filled with fluffy cottonseed, BBQ and a milk bar! The best part is every Thursday night when they open the farmer's market. A totally legit one. All locally-grown and locally-produced goods, including fresh veggies and fruits, butter, cheese, ice cream and kettle corn. I was particularly excited to go last week because my allergies have been unusually horrendous this year, and I have heard and read that eating raw, local honey can really help. I had no idea where to purchase said honey, but I figured the SuperFarm Market would be a good place to start. I was right! The vendor who sells the honey is Made By Bees. The kind woman who helped us pick our honey informed me that yes, eating raw honey is GREAT for treating allergies. Just a teaspoon a day can alleviate symptoms completely over time, but it has to be VERY local. She had two different kinds -- unfiltered raw honey that looked more like a light-yellow honey paste -- straight from the hive -- and then filtered raw honey (the amber-colored liquid you're used to seeing). She had several different varieties of each, too. Did you know honey tastes differently depending on what flower the bees pollinated? True story. Made By Bees offers wildflower, spring clover, mesquite and orange blossom. You need to know I am a FANATIC of orange blossoms. It's my favorite part about March and April here. I will go out of my way to drive past orange groves in the spring because I cannot get enough of that scent. I have always wished someone would turn it into some kind of syrup or drink because the smell is delicious. Well, guess what -- that's exactly what orange blossom honey is! Oh. My. GOSH. It's delicious. It's so wild and flavorful and you can definitely taste and smell the orange blossom in the honey. After having a tiny sample, I was sold. So I bought a jar of the filtered orange blossom honey. The coolest part is it was produced just a few miles from our home! We've only had our 1-lb. jar of honey since Thursday and look at how much we've used already. It goes great with EVERYTHING. 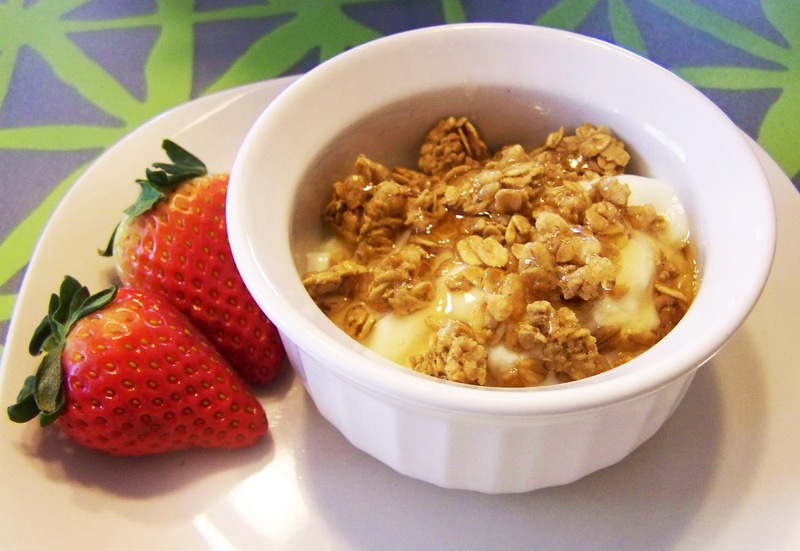 My favorite combo is drizzled over Greek yogurt and granola. (see below) Um. Delicious. The kids love it, too. Instead of candy, Bubby now asks for a spoonful of "orange honey." Smush is so excited for raw honey! I attempt to photograph my food. So, if you suffer from allergies, stop sneezing today! Go find your local beekeeper and get yourself some raw honey. Just don't feed it to babies under 1 -- huge botulism risk. 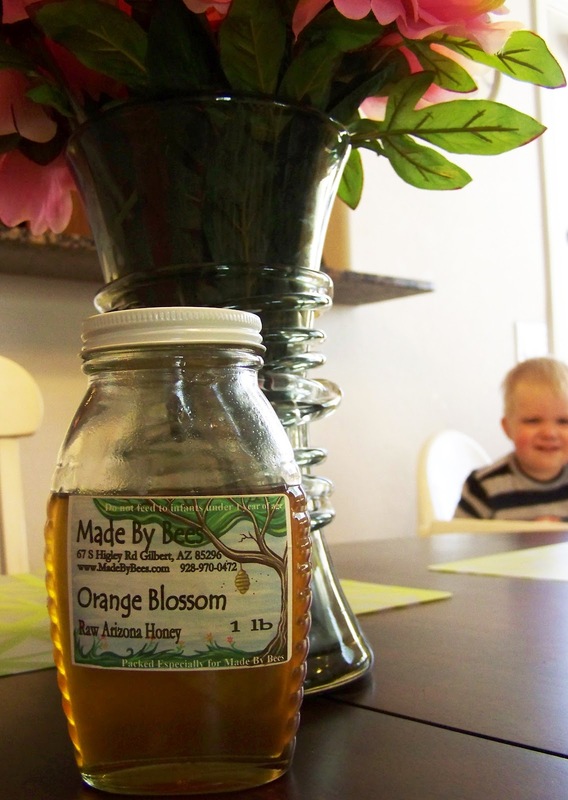 And if you're in Gilbert or Mesa, you MUST try orange blossom honey. My life is forever changed! awesome! let me know how you are doing with your allergies... who would have thought HONEY could do that? am i a freak because i love the smell of dairy farms?? there was one by my house when i was growing up and i just love it! Also. I totally agree that orange/citrus blossom are the best smell on earth. I'm so bummed that I'm missing out on my parents' orchard in bloom this year. Glad you found your honey, and that it helps keep your allergies at bay. I'll have to pass the tip on to my dad. That looks so fun!! We've been trying out some different farmer's markets lately and now I really want to go to this one!! That is almost literally in my backyard! We live in Boulder Creek right there by the Farmer's Market and I have horrible allergies! I'll have to go buy some honey now and try it out! Thanks for the suggestion! Oh I totally want to do that. I'm sold on moving down there. Now I just need to convince my husband. And you photographed your food very nicely. I want to eat that now. That's awesome! I love the Made by Bees lady, I met her a couple months ago. I bought raw honey from a place in Tempe and even though we've been eating for a year now, I haven't noticed a difference in my allergies. But, like you said, maybe it's not local ENOUGH. Have to try it, especially the Orange Blossom kind. That Orange Blossom honey made by bees is making my mouth water. Love your blog here. Thanks for stopping by for my SITS Day yesterday. Loved the pics! So it might be a bit early to call it, because it really feels too good to be true, but I started eating local honey (produced about 15 miles away). I haven't been super consistent - probably every other day average - but it's been over a week since I've taken claritin. So...take that as you will. I wish I lived near you! That honey looks/sounds delicious! Happy SITS day! I keep hearing about raw honey. I'm going to have to try this!